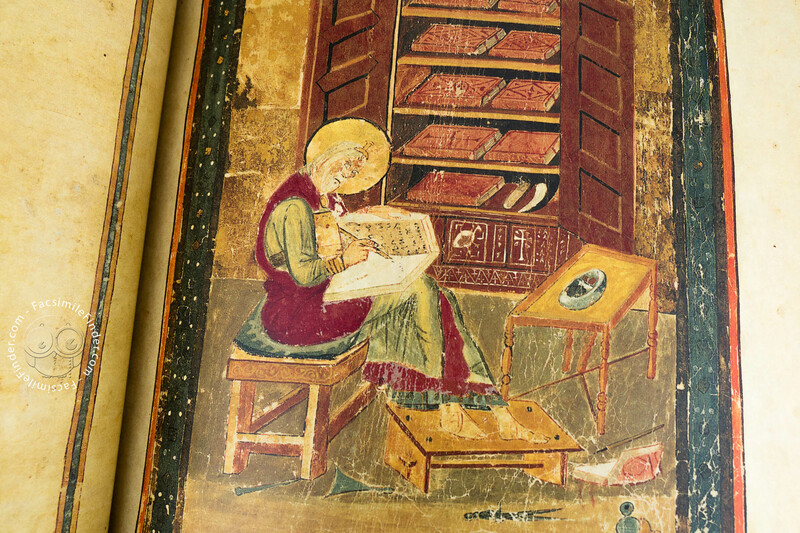 The Codex Amiatinus is considered the most accurate copy of the text by St. Jerome, and it is said to be the earliest surviving manuscript of a nearly complete Bible: the Latin Vulgate version. Nearly complete, because it lacks the Book of Baruch. Now it can be found in the Biblioteca Medicea Laurenziana, in Florence, under the shelf-mark: Cat. Sala Studio 6. 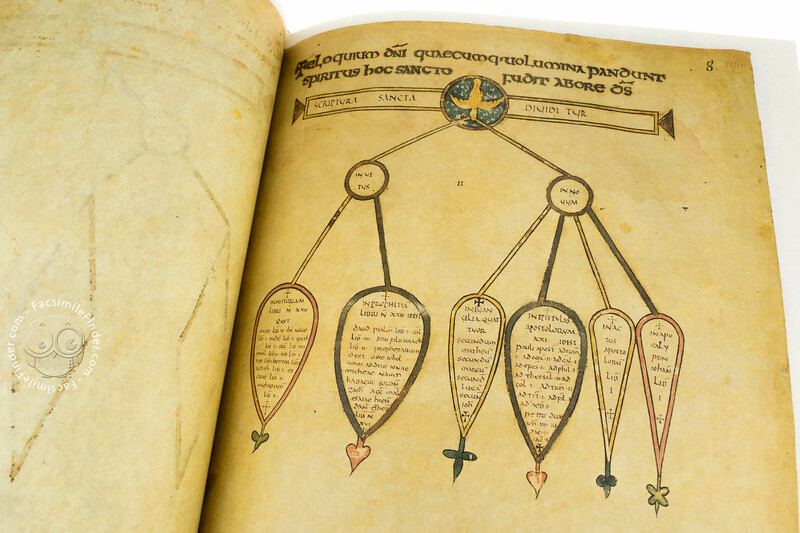 It was created, as a gift to Pope Gregory II, in Northumbria and it can be traced back to the VIII Century. 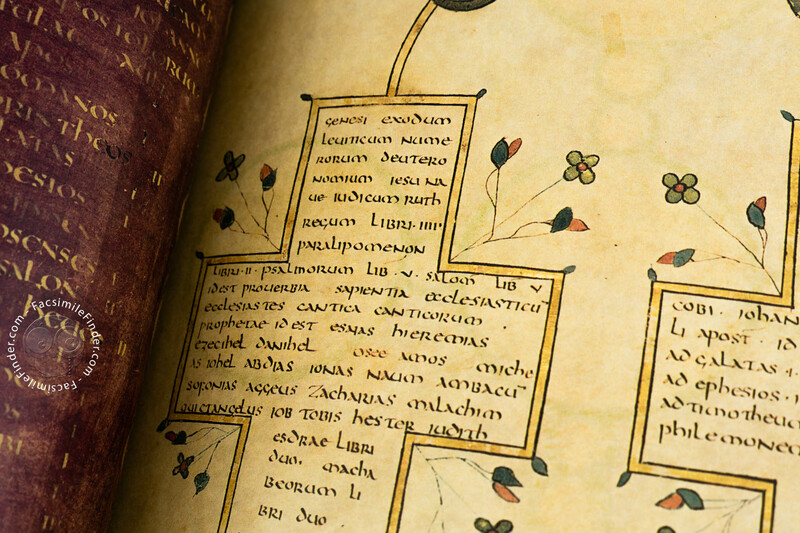 The Codex Amiatinus is a fine example of Medieval calligraphy, being written in a fine Uncial script. 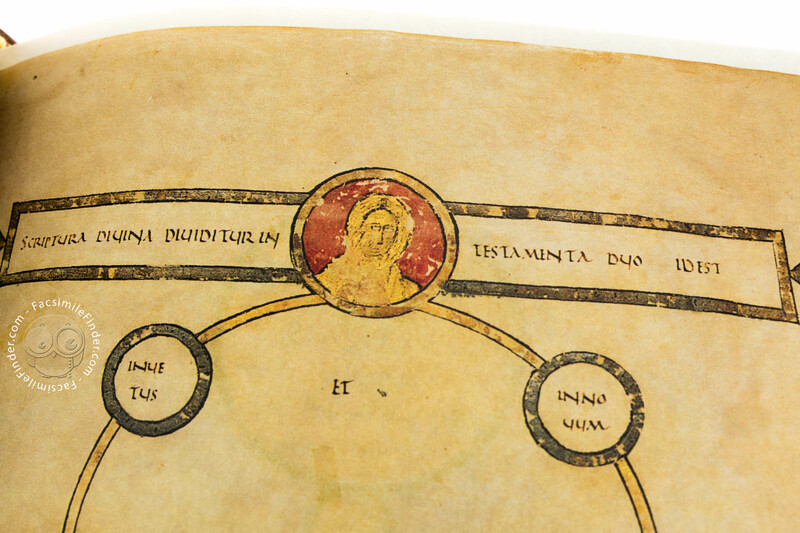 It contains the Epistula Hieronymi ad Damasu, Prolegomena to the four Gospels. 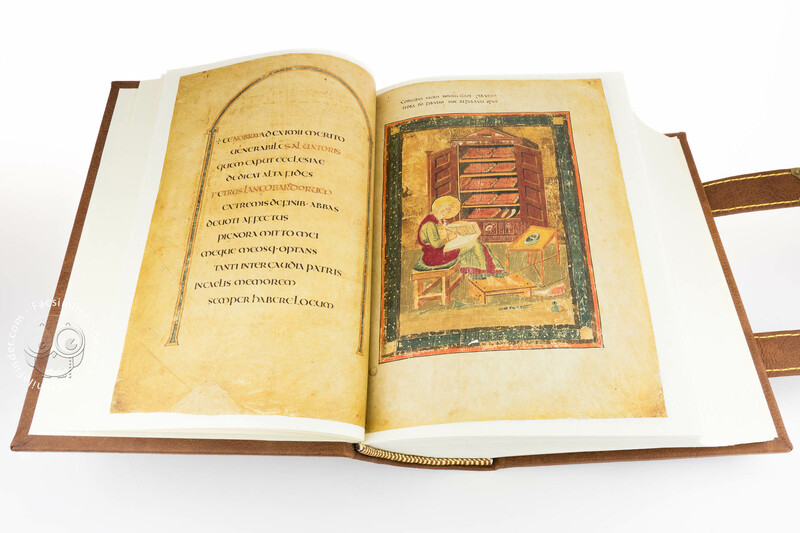 Though it can be considered an illuminated manuscript, the Codex Amiatinus lacks the ornament so many other books are full of. 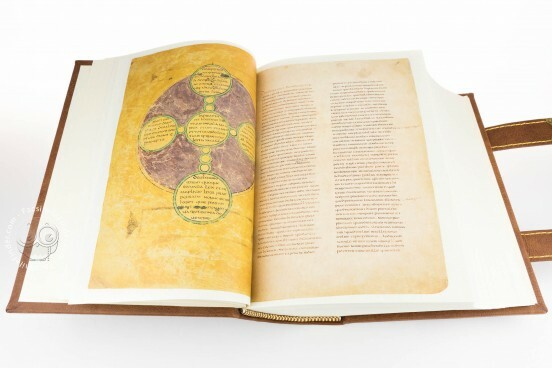 Nonetheless its few decorations, along with the two full pages miniatures it contains, make of this book a fine specimen among illuminated manuscripts. Its miniatures are peculiar in the sense that they do not resemble the usual style of the Northumbrian art (or Insular style), and can be said to have been copied from Late Antique originals. 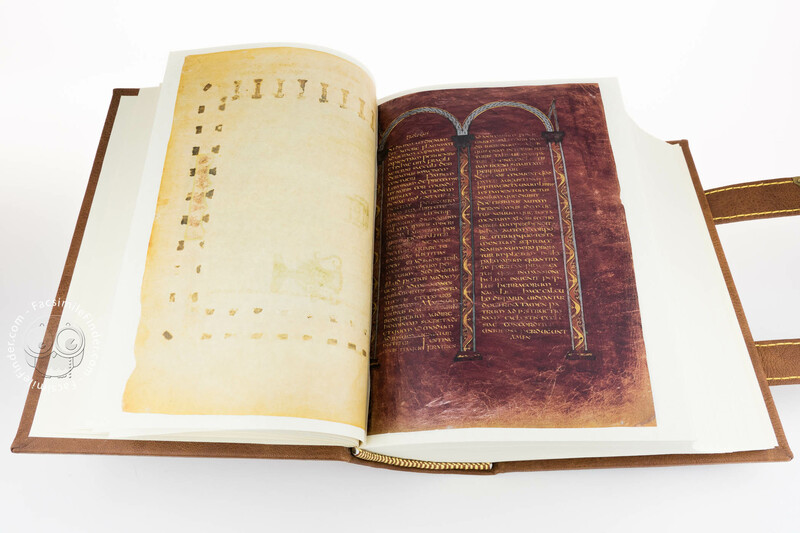 The Codex Amiatinus contains 1040 leaves made of strong, smooth vellum, that still look fresh despite their age, and are arranged into four sheets (quaternions). 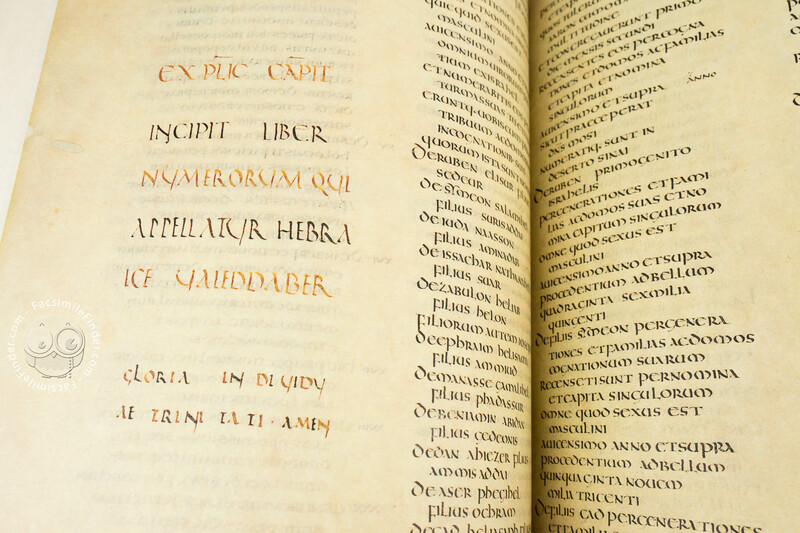 The Codex Amiatinus is written in Uncial script, arranged into two columns per page with 43-44 lines each; the lettering is large, clear and regular and often there is a little space between the words, but no mark of punctuation. The reading is given by the verse-like arrangement into cola and commata, i.e. the principal and dependent clauses of the sentence. 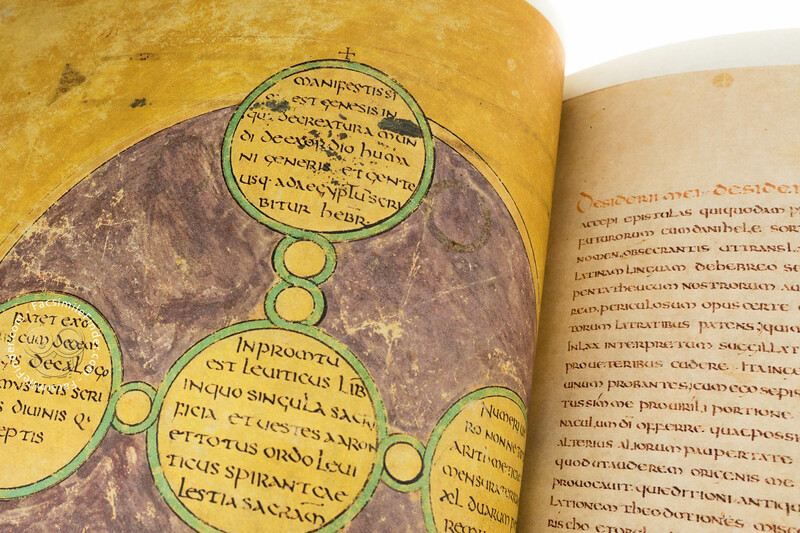 This made the experts think that the Codex Amiatinus was modeled upon the Codex Grandior of Cassiodorus, but it could even be older. 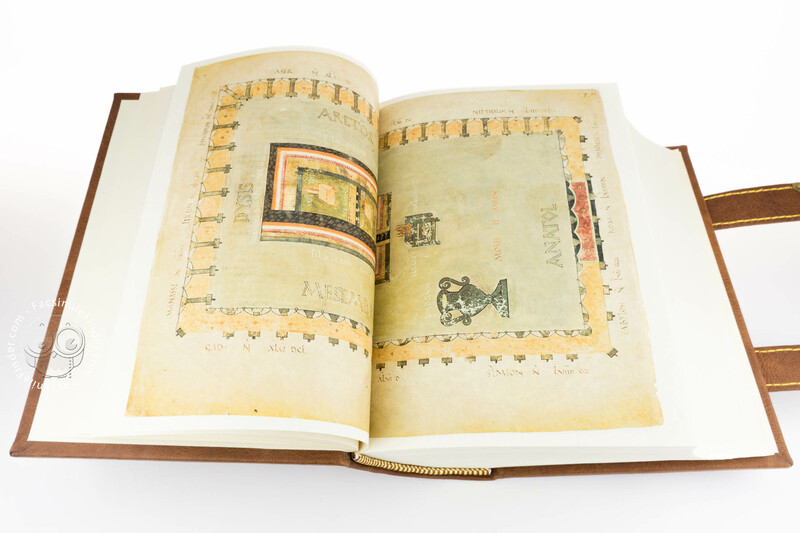 The text is divided into sections, closely resembling the Ammonian Sections in the Gospels. Ceolfrid commissioned three copies of the Bible in 692, as it is evinced from the fact that in this year the abbey of Wearmouth-Jarrow obtained additional lands to raise the enormous amount of cattle (more than 2000!) needed to produce the vellum for the book. 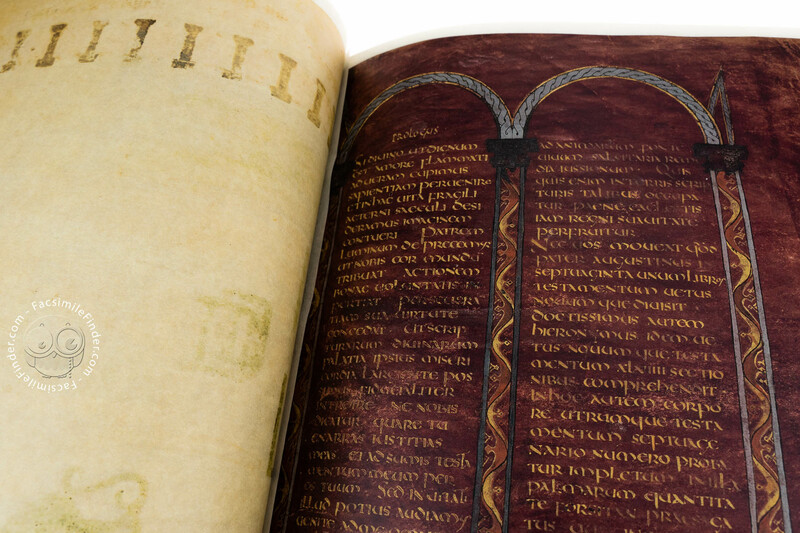 Ceolfrid intended to present the Pope with one of the copies of the Codex himself, but died on the journey to Rome. 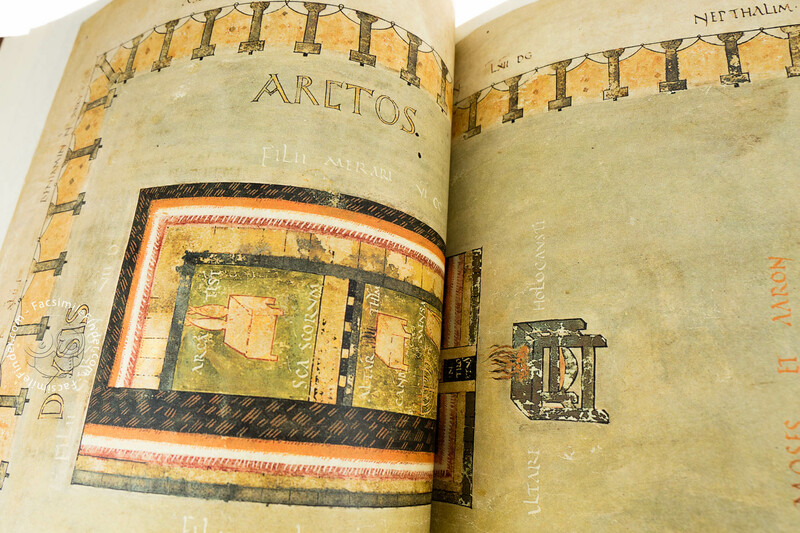 The book reappears, in the 9th century, in the Abbey of the Saviour (Abbazia di San Salvatore), Amiata mount, located in Tuscany, from which it derives its name. In the year 1786 it was acquired by the Biblioteca Medicea Laurenziana in Florence. 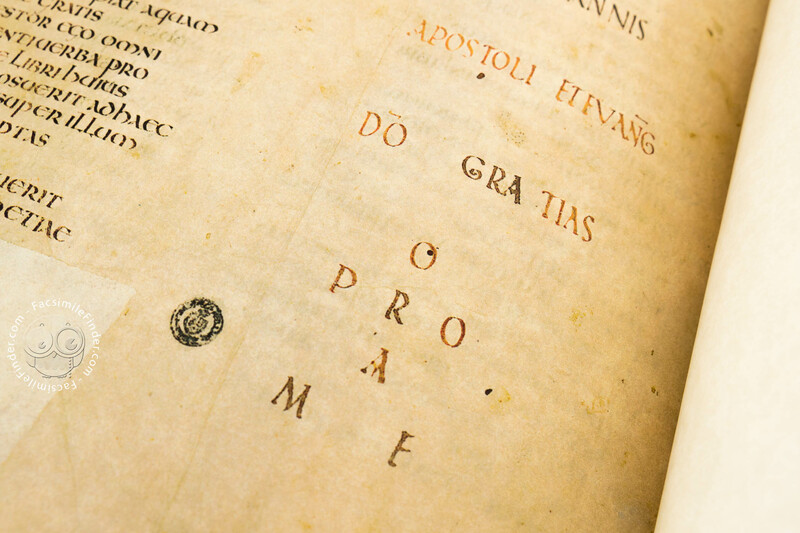 Unfortunately, the dedication page was altered, but the librarian Angelo Maria Bandini managed to reconstruct the history of the book enough to suggest that the author was Servandus, a follower of St. Benedict, and that the Codex Amiatinus was produced in the Monte Cassino Abbey around the 540s, thus making this copy the oldest among those of the Vulgata. 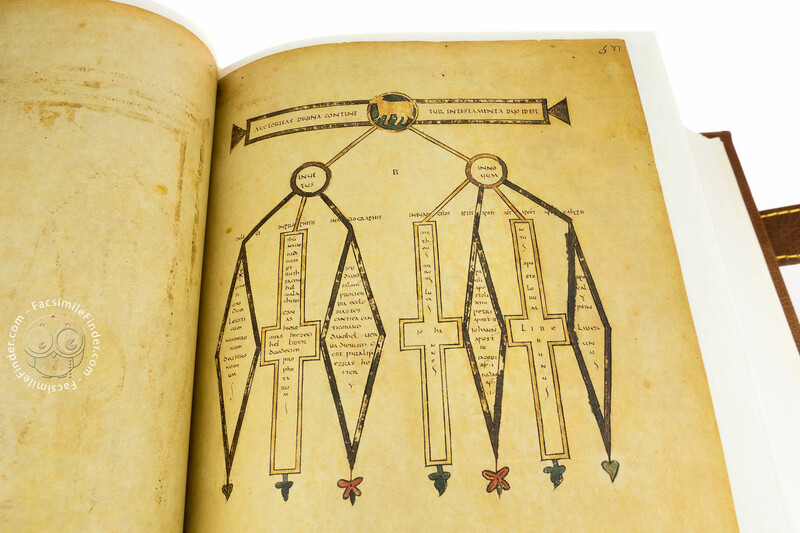 German scholars, though, noted that it is remarkably similar to a text from the 9th century. 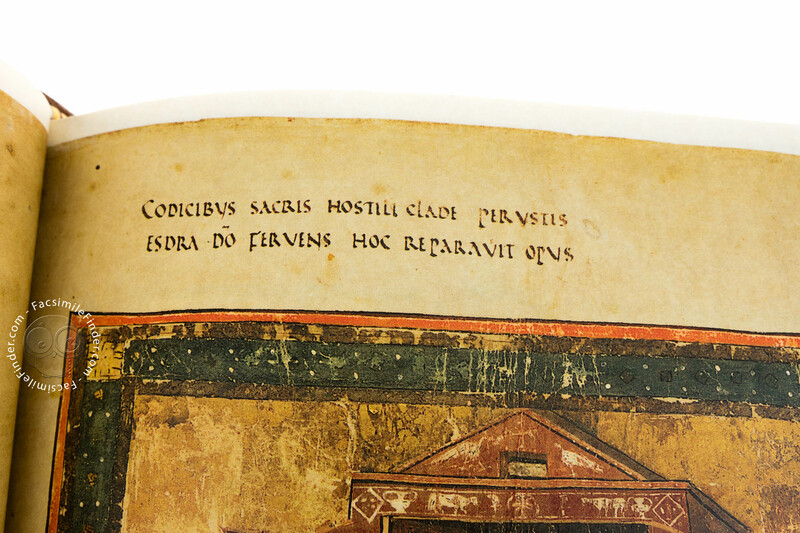 In 1888 Giovan Battista de Rossi established a connection between the Codex Amiatinus and the Bibles mentioned by Bede, relating the book to the Greenleaf Bible fragment in the British Library. This new dating removes almost 150 years from the age of the Codex, which, nonetheless, remains the oldest version of the Vulgata. 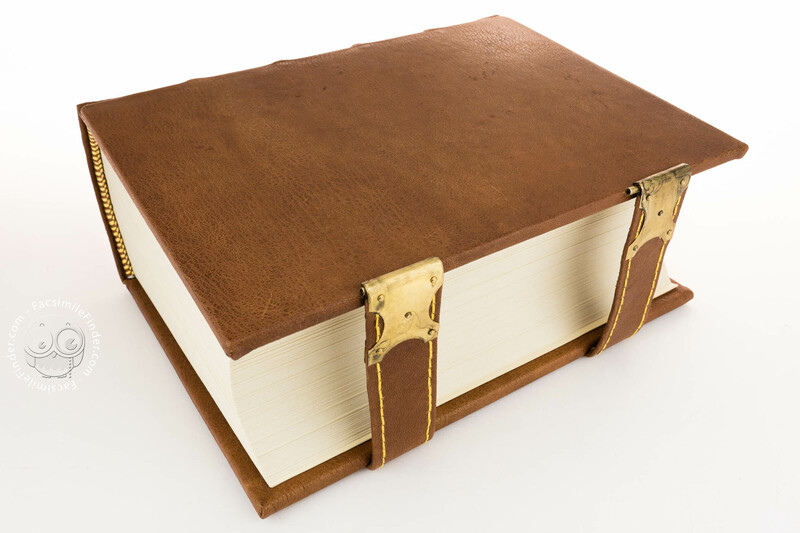 Manuscript book on parchment − 49 × 34 cm − 2080 pp. 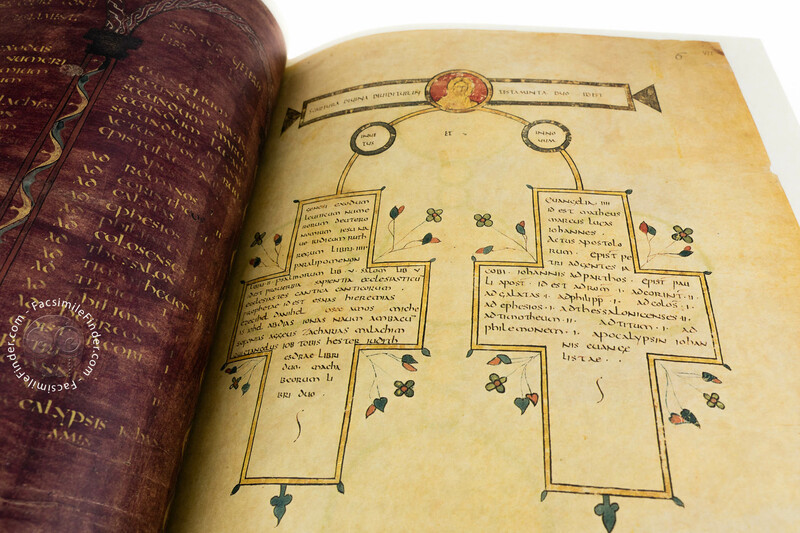 This is a partial facsimile of the original document, Codex Amiatinus: the facsimile might represent only a part, or doesn't attempt to replicate the format, or doesn't imitate the look-and-feel of the original document. 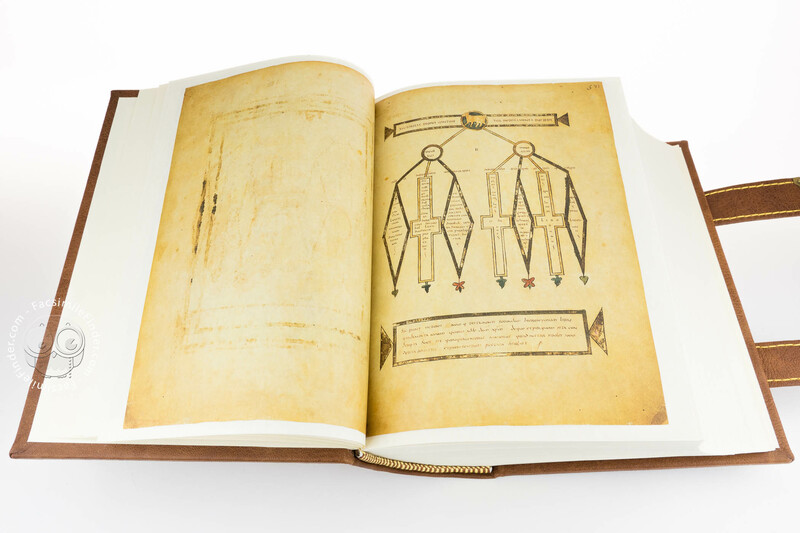 The facsimile is the complete reproduction of the whole original document. 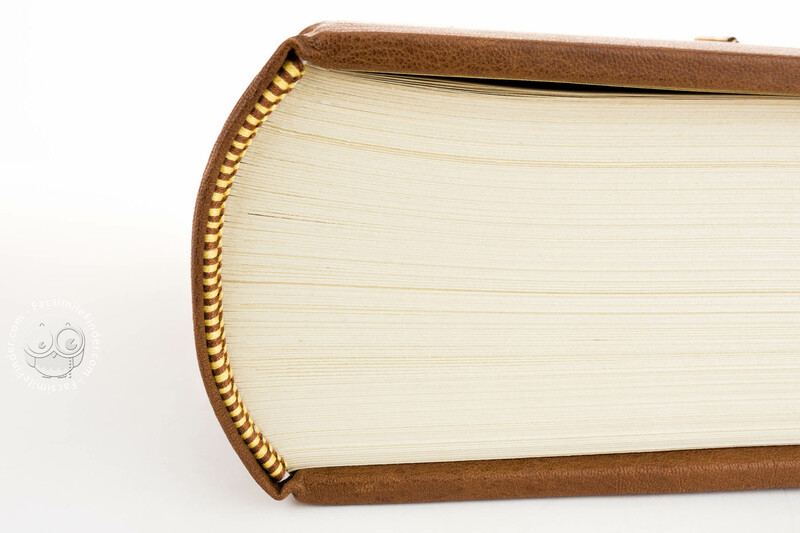 The pages - not trimmed according to the original - are reduced in size and set on a larger white background. There is no commentary volume accompanying this edition. 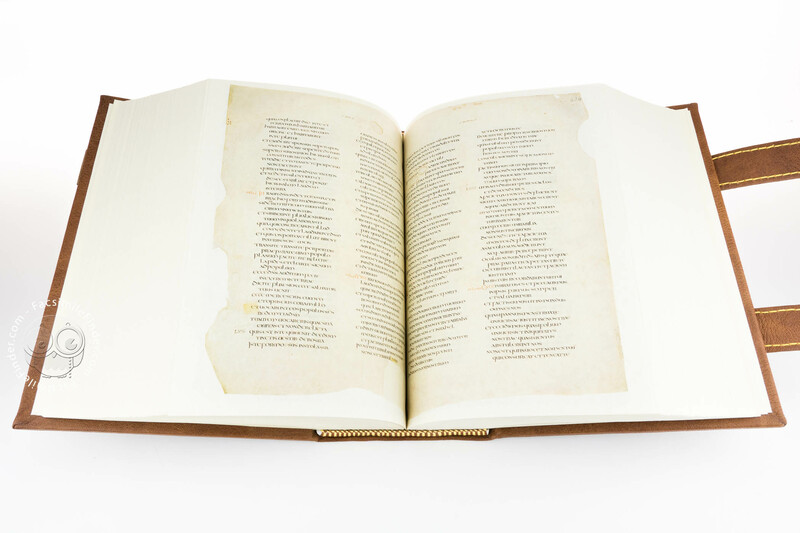 After being unbound, the manuscript has been reproduced on a series of negatives, which have been used at first for making a replica of the same dimensions (donated to the Abbey of San Salvatore for its Museum). During the phases of the reproduction, scientific analyses have been made on the colors of the miniatures and thanks to the collaboration of various professionals the correct sequence of the folios was also defined. The 'new' ordering corresponds to the one the leaves have had for the longest period of time until the manuscript's rebinding before 1784, the year in which it was fully described by the Laurentian Librarian Angelo Maria Bandini. This arrangement is carefully followed in the reduced-size facsimiles.